Not only is the new He-Man movie not dead in the water, but it's about to receive a brand new (and hopefully better) script. It's been almost twenty-five years since a Masters of the Universe film appeared in movie theaters. Honestly, when you think about it, that's probably about the right amount of time to get rid of the bad taste that movie (and Dolph Lundgren's horrible attempt at an American accent) left with the general public. However, a new movie reboot has been in the works for a while, and it turns out that it's actually progressing along under the new guidance of Sony. Over the past three years, the movie switched from Warner Bros. to Sony Entertainment and has had a few different directors rumored to be attached. The initial script, written by Justin Marks, was thrown out last year - probably for the best, since he was the dude who wrote Street Fighter: The Legend of Chun Li - and a new one was commissioned to be penned by Alex Livtak and Michael Finch (who wrote Predators). "One of other things I'm really excited about is we're doing a reboot of the 1980s franchise Masters of the Universe. The He-Man franchise. Very excited about that. Should have that script very soon. I'm praying that we can start figuring out how we're going to make it." Finch and Livtak have proven that they can take a tired franchise and inject some new life into it, so hopefully they'll be able to do the same for He-Man & The Masters of the Universe. Personally, I'm hoping they do something fresh and fun with the story that will still honor the original animated series while mocking the movie from the 1980s. 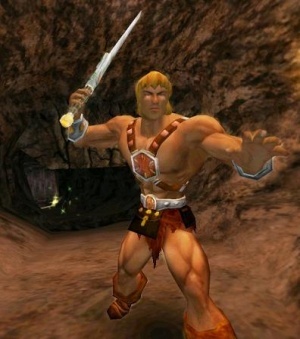 Oh, and pretending that The New Adventures of He-Man never existed.